With the evolution of technology and increasing globalisation of communications and transport, competition has intensified for all goods, including fresh fruit. For a country to survive in this competitive environment, it has to keep a steady flow of products, with minimal transport times and high quality, all at a reasonable price. George Kallitsis, export manager at Greece’s Protofanousi Fruits SA (Proto), examines the potential of three products for which Proto is the country’s leading exporter: kiwifruit, cherries and grapes. Fresh fruit, like meat and vegetables, is a difficult commodity to trade. Transportation has to be immediate and fast to retain freshness, but the low prices received by growers are often unsustainable given the high costs. The EU is providing financial assistance to many growers, but seasons when producers will struggle to break even are now expected to occur more frequently. Greek growers may not lead the agricultural sector when it comes to innovative solutions, but they adapt quickly to changing markets. They have realised that specialisation is the key to survival, as opposed to growing small quantities of various fruits and vegetables. Kiwifruit, cherries and seedless table grapes are among the commodities in which Greek growers have specialised – smartly, as it turns out. 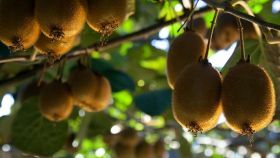 Kiwifruit has been growing in Greece for more than 40 years, but it is only in the last decade or so that the fruit has received proper attention from growers and government alike. Thanks to the continuous efforts of Greek exporters, not least Proto, which is the country’s leading fruit exporter, high quality Greek kiwifruit is available globally. According to George Kallitsis, kiwifruit cultivation has increased from 8,450ha in 2016/17 to 9,100ha in 2017/18. Of the 220,000 tonnes harvested in 2017, more than 80 per cent was exported, mainly to Europe and Asia. With more trees being planted annually, Kallitsis expects Greek production to surpass 250,000 tonnes of fruit within the next two years, reaching around 300,000 tonnes by 2022. As for Proto, the company handled 13,300 tonnes in 2016 and 15,000 tonnes in 2017. Cherries are a very difficult fruit to handle, with a small window of approximately one and a half months to harvest, pack and ship to retailers. There are many different varieties available with distinct characteristics. While size is obviously important, colour, crunch, taste and shelf-life also make good varieties stand out the rest. While many varieties are grown in Greece, Germensdorfer, Ferrovia, Skeena, Cordia and the Greek Bakirtzeika are the main exports. In 2014, production stood at 70,000 tonnes, increasing by 10,000 tonnes in 2015 and reaching almost 100,000 tonnes in 2016. In 2017, production dipped to 84,000 tonnes. Official numbers have not yet been issued for 2018, but the heavy rainfall at the end of June caused significant damage. Exports stand at 20,000 tonnes a year, with the main markets being Germany, Italy and Scandinavia until late July. According to Kallitsis, Proto handled 4,000 tonnes in 2017 and almost 5,000 tonnes in 2018, making it the leading Greek exporter. In 2017, Proto invested in a 20-line optical sorter/grader with a capacity of 30 fruits per second, allowing the company to handle 10 tonnes of cherries an hour, depending on the size of the fruit. Table grapes created global revenue of €14.89bn in 2017. The EU produced 1.45m tonnes of table grapes in 2017, which represents 6 per cent of global production. China accounts for 49 per cent, India 13 per cent and Turkey 9 per cent. Italy is the main EU table grape producer with 58 per cent of production, followed by Greece with 1.4 per cent of global production. Unfortunately for the EU, and Greece in particular, it is difficult for growers to remain competitive in the global table grape market. According to Kallitsis, farms in Greece are usually small, making costs difficult to bear. Victoria, Crimson and Thomson are the main varieties exported from Greece, predominantly to other EU countries, above all the UK and Germany. Demand is increasing for seedless grapes that are available for a longer period, up until Christmas if possible, which has led to the planting of later varieties. Proto is testing more than 12 new varieties of white, red and black grapes to satisfy this demand, according to Kallitsis.